The cost of equity can be defined as the minimum rate of return required by the shareholder or investor when equity is being put into the firm. Let’s take an example of a stock X whose Risk free rate is 10%, Beta is 1.2 and Equity Risk premium is 5%. Let’s take the example of an Indian company Reliance. Equity Risk Premium (E(Rm) – Rf) can be assumed from Damodaran’s website who is an NYU professor and he calculated market risk premium for all countries. As one can see Equity Risk Premium for India is 8.6%. Let’s take an example of a company Exxon Mobil listed on New York Stock Exchange. As one can see Equity Risk Premium for the United States is 5.96%. The cost of equity can be defined as the minimum rate of return required by the shareholder or investor when equity is being put into the firm. This particular return is associated with the risk premium over 10 year government bond yield as this bond is generally deemed to be a risk free investment. Cost of equity can be measured either by dividend discount model or the more followed Capital Asset Pricing Model (CAPM). The Capital Asset Pricing Model uses Risk Free Rate, Beta and Equity Risk Premium to measure cost of equity for any firm or business. Risk Free Rate – This is the return investor expects from a completely risk free investment. Generally, 10-year government bond yields are used as a proxy for risk free rate. It is assumed that 10-year government bond yield due to the security provided by the federal government has no default risk, no volatility, and beta of zero. Beta – Beta can be defined as the degree to which a company’s equity returns vary with the return of the overall market. Beta is the function of both the business risk and financial risk. It is measured by regressing the stock’s returns with the market returns over a period of time such as 5 years or 10 years. Generally beta takes values either less than 1 or greater than 1. Higher beta indicates that the company’s stock price has a lot of volatility which would increase the cost of equity. Equity Risk Premium – It can be defined as additional compensation that investors expect for putting their money in risky assets. They demand this additional compensation because markets have more volatility than the safer bonds. Equity risk premium can be estimated from market sources. The widely used source is risk premium released by NYU Stern professor Damodaran which is used by multiple investors. The Capital Asset Pricing Model is widely used by investors to calculate the cost of equity. This is the expected return required by investors for putting their money into risky assets. This calculation of Cost of Equity is then used to calculate the Weighted Average Cost of Capital which is then used as a discounting factor in financial modeling for various purposes. Cost of equity is always cheaper than cost of debt since debt investment is secured through assets and debtholders have a higher preference than equity holders if the company is liquidated. Cost of equity is also important in determining the amount of debt that a company wants to take. Any company has an optimum capital structure and hence calculating cost of equity helps in determining the amount of debt that is required so that optimum capital structuring can be achieved. Cost of equity can vary across industries and across companies in various industries. For example, utility companies will have a very low cost of equity. This is due to low beta of these companies as they are not affected a lot by market movement. On the contrary, steel companies have a very high cost of equity because they are affected a lot by market movement and can be considered risky investments. 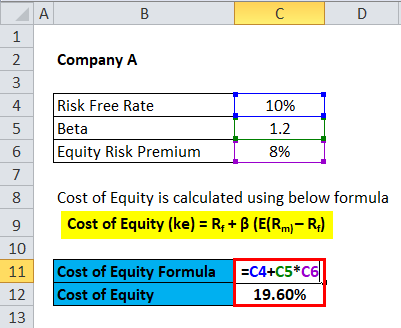 You can easily calculate the Cost of Equity using Formula in the template provided. The cost of equity is the required rate of return by investors for putting their money in a firm or business. The Capital Asset Pricing Model is used to estimate cost of equity. 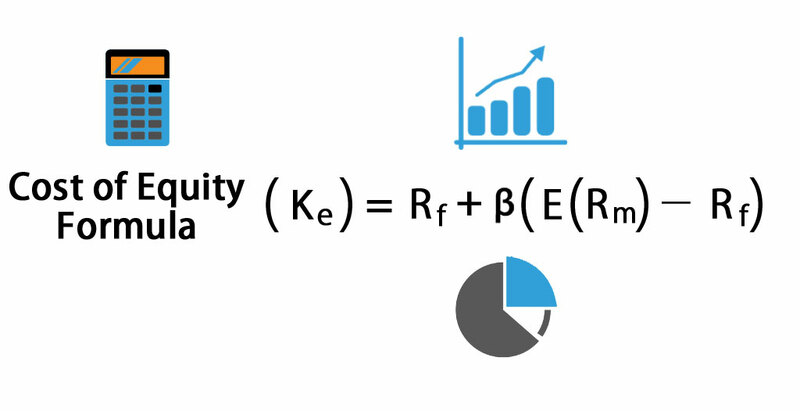 Cost of equity is measured using variables such as Risk Free Rate, Beta and Equity Risk Premium. Cost of equity of various industries and companies across similar industries can vary due to external and internal factors.